With Adobe Creative Suite, if you’re just looking to set up and run CS6 on either a Windows PC or a Mac OS system, the instructions for that are easy. And in fact, as we discussed earlier, it’s relatively straightforward to install and activate the software on up to two machines of the same operating system type – in other words, either two Mac computers, or two Windows PC’s. However, there is another possibility if you want or need to have the applications available on both operating systems (Windows plus Mac OS) at the same time – and that is to get an Adobe volume license. Despite the name, anybody can buy them (not just businesses and even for just one copy), though they do offer discounts for larger purchases… and there are some additional advantages too. They’re easy to get – no signature contracts are necessary and you can pay online with a credit card, and download right away. Adobe Volume Licensing (AVL) customers receive product serial numbers for both Windows and Mac OS, as long as the product is available for both and the two platforms are the same version. Program members can choose to use either platform, as long as the total number of licenses being used does not exceed the number purchased. As we’ve covered previously, each license purchased from Adobe allows the user to install and activate the product on up to two computer systems, so long as they are not both used or run at the same time. These are the same terms as for all customers written in the Creative Suite licensing agreement. If you happened to make a purchase recently and didn’t get what you needed, you may also know about Adobe’s 30-day Return & Exchange Policy. 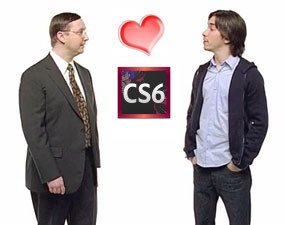 Can You Save/Open CS6 Files on CS5, CS4 or CS3 – and Vice Versa? we lost our disk and replaced the computer the program was on. we have our serial number but just either need a new disk or direct link to cs6. Those are the trial versions that can be activated to be the full version when you enter your valid, purchased serial number. If you have any further questions or issues, please read through the comment section there. I have had trouble with Mac’s latest High Sierra operating system not allowing me to re-install my Adobe Creative Suite 6, as well as my HP Officejet 8600 – and wondering if anyone can help me, because three trips to the Apple store and also many phone calls to their support have not. Hello William, all Adobe Creative Suite software is over six years old and end-of-life. Meaning, it is no longer supported and there are no guarantees about running on modern hardware or operating systems. Most computer software has a limited lifetime of viability before this happens. Typically, the main issue is about the core operating system support for older runtimes and dated API’s in programs that were written in 2011-2012. To be clear, this has far more to do with Apple dropping that support as they move forward, than it does Adobe. Apple is notorious for doing this. Microsoft is a bit better at managing old interfaces and compatibility in later o/s releases. As with all static perpetual versions, they eventually grow obsolete and won’t run if you can’t preserve the original platform that they were built for. Upgrades and maintenance are an ongoing necessity in order to maintain virtually anything in life, especially something that moves as technologically fast as computer software. One of the important advantages of Creative Cloud is that all ongoing upgrades, compatibility updates and product additions are always included, including a steady stream of new features and performance improvements at no additional cost. So the tools will never become obsolete or stop working on a new operating system, and in fact they are written to take advantage of the speed and optimizations that the newer platforms bring. You may already be aware of some of these details, but just wanted to mention them as background regarding the situation, or if you’re having trouble running old programs on new systems… Best of luck!